Healthy teeth and gums and a beautiful smile should be within reach for everyone. At Mount Prospect Smiles we care deeply about your dental health and our support team will make every effort to make your visits as comfortable as possible. We give every patient a comprehensive treatment plan in writing and will help you understand your options and provide customized care. Our treatment coordinator will work with you on an individual basis to help make treatment affordable to you. In an ongoing effort to provide quality dentistry at an affordable cost to our patients we ask that services be paid for at the time of service. For your convenience we accept cash, check, Master Card, Visa and American Express. 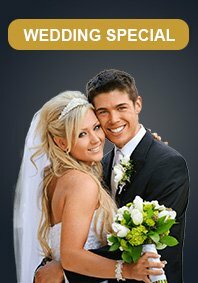 Financing options are available for extensive treatment plans. Total payment of the fee is due at each visit. Since immediate payment reduces our bookkeeping expenses, a five percent (5%) courtesy reduction of the fee on the service date will be given, as long as the entire account balance is paid in full. The fees may be paid at each visit with cash, check, Visa, MasterCard and Discover. Patients already paying reduced fees are not eligible for reduction. Co-payments and deductible payments are designed by insurance companies to enhance patient responsibility and commitment to their own dental care. Therefore, we require that patients with insurance pay the patient liability and deductibles at the time of service. The fees may be paid at each visit with cash, check, Visa, MasterCard and Discover. Patients who have insurance benefits are not eligible for discounts to avoid insurance fraud. If you have insurance benefits, as a courtesy, we will submit a claim on your behalf; however Mount Prospect Smiles is not a party to the agreement you have with your insurance company. A complete patient registration form and/or a copy of the insurance card(s) must be provided by the patient at the first appointment and updated at each additional appointment. Patients must notify our office of any changes with insurance information. It is your responsibility to know your insurance coverage, as you are ultimately responsible for the entire balance. At your request, a pre-treatment estimate form will be submitted to your insurance carrier prior to treatment to obtain an estimate of your insurance benefits. As a leader in patient financing, CareCredit has made it easy for millions of patients nationwide to get the treatment they want and need. This is a monthly payment plan offered as a separate dental line of credit to cover you and your family members’ dental care needs. Approval only takes a few minutes. There are interest free options as well as low interest extended payment plans. You can make monthly payments as low as 3% of the outstanding balance. There are no annual fees or pre-payment penalties. If CareCredit is your option, you can begin any treatment immediately and spread payments out over time. With CareCredit, you pay no up-front costs, no pre-payment penalties and no fees. 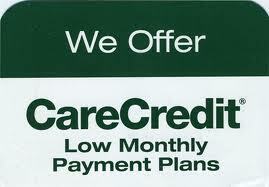 Plus, CareCredit is a revolving credit line for additional treatment or add-on charges, without the need to re-apply. It only takes a few minutes to apply for CareCredit and you may receive an online decision in seconds! Apply now or see our staff for more details. *Click for details. We want to make achieving your dental health and cosmetic goals as confusion-free as possible. Contact our practice today for more information about financing options or to schedule a consultation.